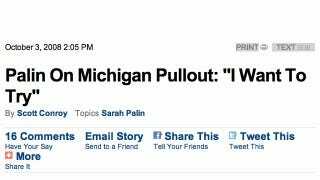 This 2008 CBS News Sarah Palin Campaign Headline Now Has A Whole New Meaning, Doesn't It? Oh, sure. The original story was about her qualms with the McCain camp's decision a month before the election not to campaign actively in Michigan. But now that Seth Davis has called everyone's attention to it again, let's all completely reconsider its thrust.